“The Future of the Catholic Church With Pope Francis” by Garry Wills. Viking Press (New York, 2015). 249 pp., $27.95. In the flurry of books published since the beginning of the papacy of Pope Francis, many have attempted to size up where the church may be headed under his leadership. 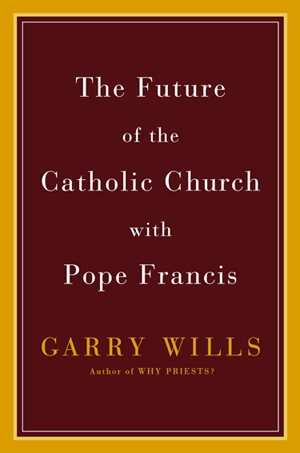 Unfortunately, Garry Wills’ “The Future of the Catholic Church With Pope Francis” doesn’t really do that. What it does do is to give a rather detailed account as to where the church has been in a number of areas, including the use of Latin, the relationship to governments, attitudes toward Judaism, sexuality with natural law and the sacrament of penance. In each of these areas, Wills gives the reader a detailed look at how we got to where we are now, at times in language too detailed and technical, which can leave the general reader puzzled. Wills knows a lot of interesting tidbits about various historical eras and issues, but that doesn’t always lead to an adequate view of the overall issue that the church has faced — or is facing now. He can tell some fascinating stories, for example, about connections between the influential Jesuit Father John Courtney Murray, and, of all people, John F. Kennedy. In the section on sexuality, he also makes an unfortunate and somewhat common mistake, confusing natural family planning with the rhythm method, which is different. Pope Francis is almost never mentioned until the epilogue in the final several pages, and even then the comments about him are rather general. So, if a reader is looking for some juicy bits about various areas of church history, this book would be helpful; if, instead, one is looking for a long-range view on where we may be headed with Pope Francis, there are other books that would be more helpful. Finley is the author of several books on practical spirituality, including “The Liturgy of Motherhood: Moments of Grace,” and has taught in the religious studies department at Gonzaga University in Spokane, Washington, for many years. NEXT: Tough choice for ‘Longest Ride’: Love the rodeo or the cowboy?